Home The Piper Jagdeo, Rohee and Ramotar: Who is in charge of the PPP? Jagdeo, Rohee and Ramotar: Who is in charge of the PPP? By now you may have forgotten the uproar over the 2 a.m. redline that Public Security Minister, Khemraj Ramjattan instituted. The imposition was widely criticized by everyone and not least by Clement Rohee, the newly installed General Secretary of the PPP. Rohee stated that there is no scientific data to back up Ramjattan’s crime-fighting move. The General Secretary was very much on the front lines in the assault on Ramjattan. That was July of 2015. August rolled around and this time the issue for the PPP (as expected) was a determined critique of the APNU+AFC’s 2105 budget. The General Secretary took a back seat and ‘allowed’ the then incoming Opposition Leader, Bharrat Jagdeo to carry the attack. Carry he did, with detailed and specific criticisms. For instance he noted that the removal of the PPP $10,000 per student transportation grant for 167,000 students and its replacement with $3337 million in grants was a net loss for students. Jagdeo also levelled pointed criticisms against the abandonment of the Amaila Falls hydro project. He told President Granger that his own advisers on the hydro project are ‘clueless’. The message was carried in the mainstream media and also made its way into the usual social media platforms and blogosphere. November rolled in and this time the issue was again crime. 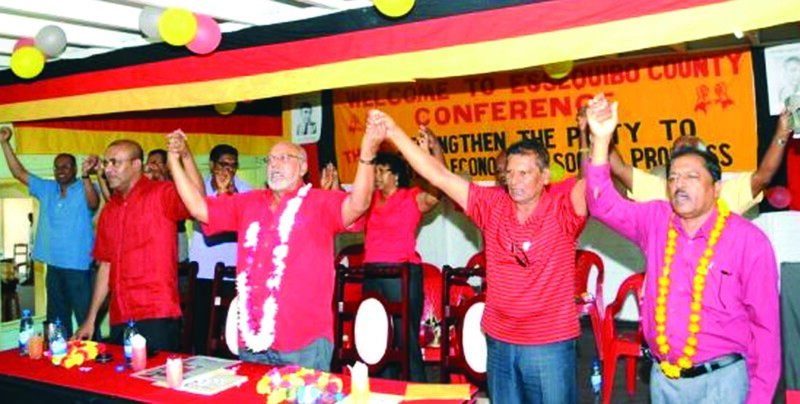 The ‘front-man’ for the PPP this time was former president and also former General Secretary of the PPP, Donald Ramotar. Ramotar intimated that Guyana was on the threshold of a crime emergency and that the attack on the home of former Crime-Chief and Assistant Commissioner of Police Leslie James was proof that things had gotten out of control. The former president stated that no one is safe in the country and urged the APNU+AFC administration to allow the GDF to work with the Police. Granger dismissed the idea. The point here is that it is hard these days to truly know who speaks for the PPP. A good argument could be made that it is not unusual for the opposition party to have a division of labour. Fair enough, but the pattern for the PPP is different, in so far as that there does not seem to be any coordination with press statements and general criticisms of government policy. While Rohee and Jagdeo are expected to speak for the Party based on their respective institutional positions, this is not the case for Ramotar. The issue is not whether the former president is making sense or not. The question is by whose institutional authority is he speaking? The larger issue, of course, is that we may be witnessing an undeclared struggle within the PPP. The struggle may not necessarily be for office or power but for legitimacy, meaning which historical trajectory of the PPP is really the genuine one. The well-known differences of the Jagan v. Jagdeo paths may still be there. Jagdeo’s ascendency to the office of Opposition Leader apparently has not solved the problem. All of this of course is quite a bit ironic because, as critics such as Ralph Ramkarran have noted, Ramotar was hand-picked by Jagdeo. Get of the PPP/C. Who speaks for this Defacto colation?????? Don’t worry about ppp. You try to run the government. we are seeing everyone speaking on behalf of APNU+afc.Ramjet and Nagamootoo don’t even know that they are from different party. Apnu ministers speak and very next day a clean U turn. yeah, don’t worry about the ppp because, it holds such a high moral and ethical standard it deserves to get a free pass every time with no questions asked. meanwhile, you continue to struggle with the fact of where ramjattan and nagamootoo are as compared to where rohee, ramotar and jagdeo are for one day your acceptance of the facts will lead you to having less envy bringing you more restful nights.